Please note : All events require registration in order to allow us to plan properly. Arrive on time, we start on time ! In the wake of significant interest and the corresponding need to integrate our current new members, we will be putting on hold future Information and Get-Involved Sessions after those offered for February for the time it takes us to be able to properly welcome and integrate new members once again. Nevertheless, please feel free to contact us in the mean time with any questions or requests for information that you may have. Wednesday, February 11 from 6:30 P.M. to 8:00 P.M. Registration is free and required, click here. Wednesday, February 25 from 6:30 P.M. to 8:30 P.M. 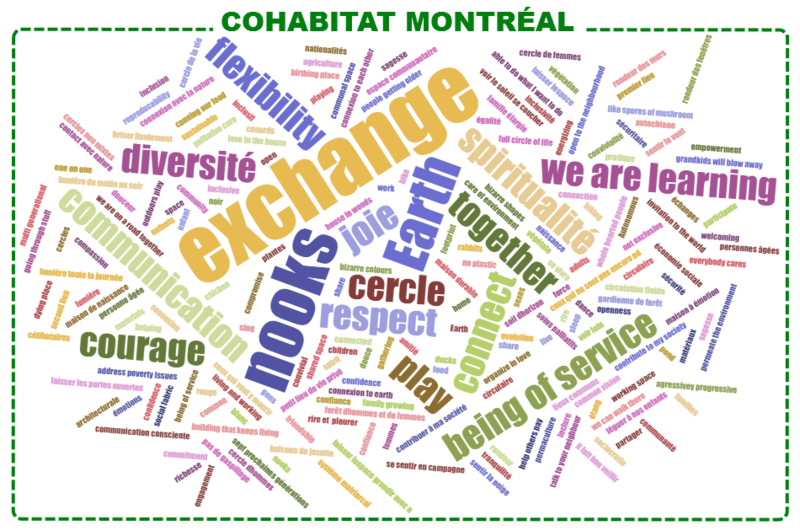 These workshops are open to all Becoming Members, Full Members and Allies of Cohabitat Montréal. If you are not sure if this applies to you and you are interested in participating, please feel free to contact us. Date to be announced – From 10:00 A.M. to 5:00 P.M. Registration is required, coming soon. Date to be announced – From 12:30 P.M. to 5:00 P.M.